Auto defogging reduces the probability of fogging up the inside of the windshield by automatically sensing the moisture of inside the windshield. The auto defogging system operates when the heater or air conditioning is on. This indicator illuminates when the auto defogging system senses the moisture of inside the windshield and operates. 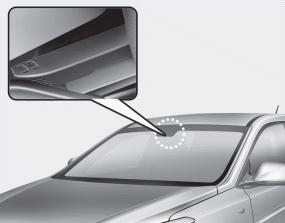 If auto defogging does not defog the window at step 1, outside air position, step 2, blowing air toward the windshield occurs. The auto defogging system is automatically activated when the conditions are met. However, if you would like to cancel the auto defogging system, press the front defroster button 4 times within 2 seconds while pressing the AUTO button. The indicator of the front defroster button will blink 3 times to notify you that the system is cancelled. To use the auto defogging system again, follow the procedures mentioned above. If the battery has been disconnected or discharged, it resets to the auto defogging status. When the air conditioning is turned on by Auto defogging system, if you try to turn off the air conditioning, the indicator will blink 3 times and the air conditioning will not be turned off. For efficiency, do not select recirculated air position while Auto defogging system is operating.